Fifty-one plate appearances. After missing a little more than seven weeks with a chip fracture in his right wrist, Aaron Judge received 51 regular season plate appearances to get back up to speed at the plate. That’s all. The minor league postseason had ended, so he couldn’t go out on a proper rehab assignment, and instead had to rehab in the big leagues, essentially. It wasn’t ideal, but there was nothing else the Yankees could do. In those 51 plate appearances Judge hit .220/.333/.341 (87 wRC+) with one home run, eight walks, and 15 strikeouts. The plate discipline numbers were right where they always are. Judge had a 15.7% walk rate and a 29.4% strikeout rate after returning, which are right in line with his career norms. I was worried his strikeout rate would spike initially because his timing would be off. Didn’t happen. The good news: Judge is still hitting the ball in the air. 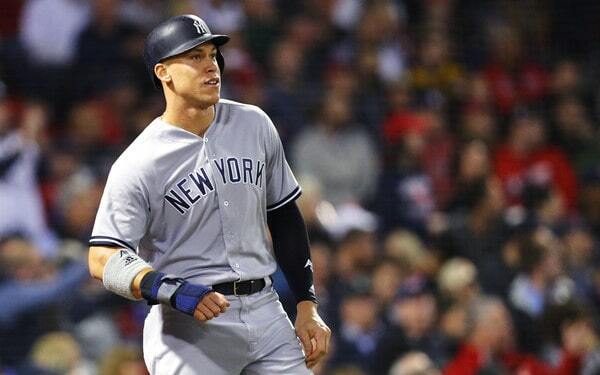 The bad news: Judge clearly has not hit the ball all that hard since returning from the wrist injury. And that is not surprising. Wrist injuries are known to sap strength even after the player is declared healthy and able to play. We don’t have a big sample size here at all. Twenty-eight balls in play since the wrist injury. But that’s all we have. 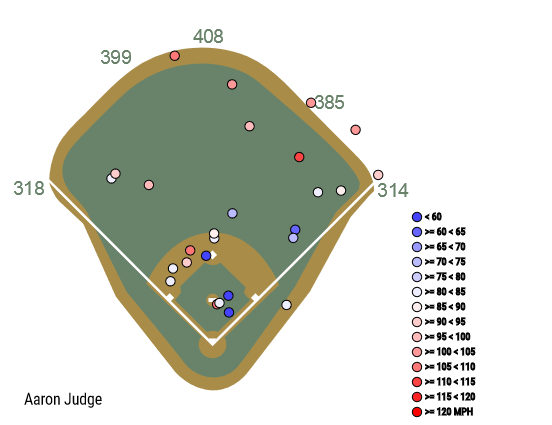 The other good news: Judge is hitting the ball harder as he gets further away from the wrist injury. Last Thursday he hit a ball to the warning track in Tampa for a sacrifice fly. The next night he hit his first (and so far only) home run since returning from the wrist injury, and it was not a cheapie. Judge hit it out to dead center field at Fenway Park. That was the kind of pitch Judge should’ve hammered. It was a 91 mph fastball from a lefty that was up in the zone a bit and over the plate. You want Judge to hammer a pitch like that. And he did! He was missing similarly hittable pitches soon after returning from the wrist injury. Either missing them or just not hitting them hard. The home run was a very welcome sight — “I’m glad he got that one out of the way,” said Thames — just because I wanted to know Judge still had it in him before the start of the postseason. I mean, I knew it was in there. But I wanted to see it. Judge has eight batted balls at 100 mph or better since returning from the disabled list. Three of them came within his last six batted balls and five came within his last 13 batted balls. The strength is returning. In this tiny little 51 plate appearance/28 batted ball sample of post-injury Aaron Judge, I’m encouraged about three things. One, Judge’s elite level plate discipline is still intact. He swinging at strikes and taking pitches out of the zone. Two, his swing-and-miss rate has not spiked. Judge had a 13.7% swing-and-miss rate before the injury and it’s a 14.4% swing-and-miss rate since the injury. The small increase can be attributed to normal in-season fluctuation. I was worried his timing would be non-existent and we’d see an 18%+ whiff rate or something like that. Hasn’t happened. And three, the strength does seem to be coming back. Judge had the long sacrifice fly Thursday, the home run Friday, and several other hard hit balls over the weekend. It was always going to take some time for Judge’s power to return. The question was how much time? A week? A month? Six months? No one really knew. Not even Judge and the Yankees. We’re starting to see the power return now though, and just in time for the postseason.